New Delhi : Speaking at a town hall meeting at Talkatora stadium in New Delhi, Prime Minister Narendra Modi said, "Enough time has been wasted on India-Pakistan talks, Pakistan will die its own death." On a question - what would have been his next step if Balakot Air Strike had failed? He responded, "Balakot I didn't do. The jawans of the country did it. Our security forces did it. I salute them." "They have been saying that there are no terror camps. Now they have to hide it. They are not allowing anybody to go there. 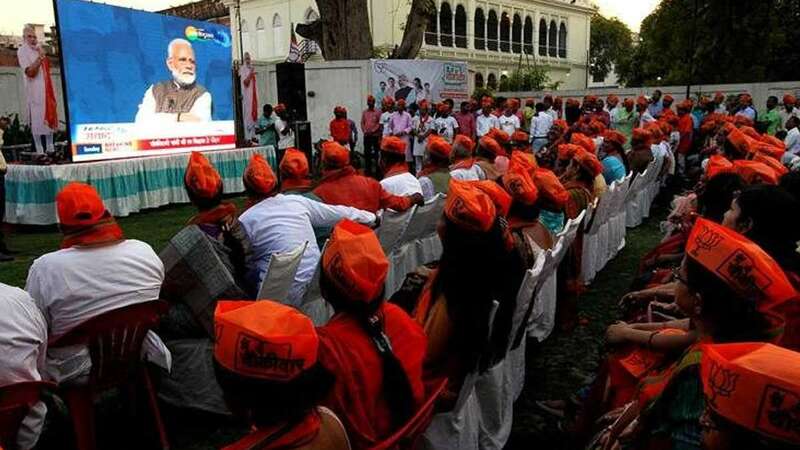 We've been told Balakot area is being reconstructed by Pakistan to show that a school is being run there, so that people can be taken there and shown that no terror camp existed there," PM Modi said. Pakistan is now in a fix where if they accept air strike then they will have to take a action against terror camps. Pakistan has been saying that there are no terror camps. Now they have to hide it. They are not allowing anybody to go there. We've been told Balakot area is being reconstructed by Pakistan to show that a school is being run there, so that people can be taken there and shown that no terror camp existed there, Modi said. Taking his chowkidar campaign ahead, he said that new India does not need more rajas and maharajas. Responding to a question, PM Modi said, "Country does not need rajas and maharajas. It makes me happy that the spirit behind chowkidar is expanding. I have taken the corrupt to jail till now. After 2019, they will be behind bars." "Some people don't have faith. And those who have limited thinking they feel that chowkidar has.... A uniform, cap and whistle," PM Modi said in New Delhi today. "I have faith in the Indian Army. They will never do work that will cause shame. I have faith in them and in their discipline," Modi said. PM Modi said that he received support from the entire nation over the last five years. "Today, everyone here is a chowkidar. Today, I want to spend some time with you chowkidars," he said, adding, "In this 2019 election, every chowkidar is fighting with me. I believe that people of country are like chowkidars."